If you last visited your own blog 2 months ago – how do you even expect others to do so? I know. I’ve been terrible at this. And if I have to tell you all the reasons why that is, you might just want to run up the hills with me and never come back. So…let ‘s just forget that. I am back. I drive over this Reservoir almost daily. It never looks the same on any two given days. What you see depends greatly on the weather and circumstances surrounding it on the day and the days before that. Some days it shows its’ true beauty and perfect reflection. We are the same. 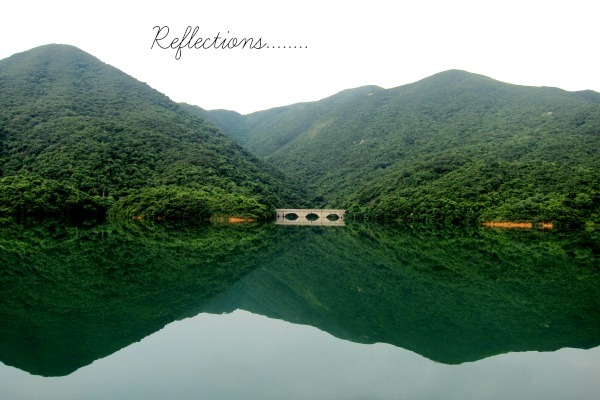 Things surrounding us….the people, the places….. the aroma and air around us….that all makes us reflect differently on different days and cast our reflection out depending what has been happening to us for a while. Some days it gets so foggy around me, that it is hard to even see myself clearly – let alone let others see what is going on. The cloudy atmosphere cover my body,mind and soul. I can’t see through the fog and others can’t see in. It is unavoidable to let that which is in our direct space, not affect us…. But we should not let that change what is within us. But then there comes a day …..and after the storm, things clear up pretty well and out of nowhere, the cleansing help us bring forth again clarity and a clear perimeter to let us reflect and project our thoughts and ideas and become radiant again. And I become an object that can reflect and affect. Do not lose hope. I have to remind myself often. The storms will pass and the fog will clear and then we can think, act and plan again…. for a better day has, or are yet to, come. But it will.